The Carbohydrate Structure Databases (CSDBs) store structural, bibliographic, taxonomic, NMR spectroscopic, and other data on natural carbohydrates and their derivatives published in the scientific literature. The CSDB project was launched in 2005 for bacterial saccharides (as BCSDB). Currently, it includes two parts, the Bacterial CSDB and the Plant&Fungal CSDB. 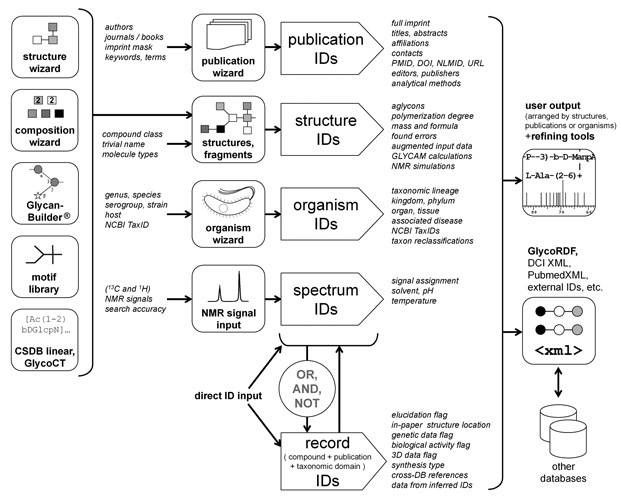 In March 2015, these databases were merged to the single Carbohydrate Structure Database (CSDB). The combined CSDB includes information on bacterial and archaeal glycans and derivatives (the coverage is close to complete), as well as on plant and fungal glycans and glycoconjugates (almost all structures published up to 1998). CSDB is regularly updated via manual expert annotation of original publications. Both newly annotated data and data imported from other databases are manually curated. The CSDB data are exportable in a number of modern formats, such as GlycoRDF. CSDB provides additional services for simulation of 1H, 13C and 2D NMR spectra of saccharides, NMR-based structure prediction, glycan-based taxon clustering, and other. The combined CSDB is available free of charge at http://csdb.glycoscience.ru/database/.